After a good night’s sleep on a beautifully soft pillow and comfy bed, I managed to not only wake early on Saturday morning – but to get up early too – at about 8am. 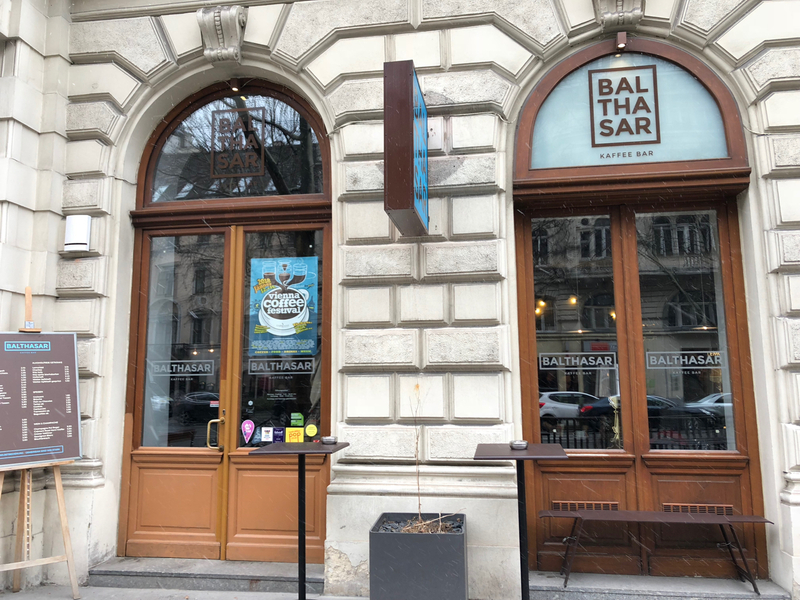 I was off to explore districts outside Vienna’s centre today, but first I was determined to get out for a tasty breakfast. I’d done a bit of research online as to where I could find just that, and as luck would have it there was a highly rated spot just a ten minute walk from my hotel. Turning into a little square just up the road, I saw yet another pretty church – there’s a lot of them in Vienna. And around the corner from the church lay Ulrich. It might not look busy, but it turned out I was lucky to get in! When I entered the smart spot I was asked if I had a reservation. It was only 9am, but the place was packed already, though thankfully it wasn’t too noisy. After explaining I’d neglected to make a reservation, luckily I seemed to get the last table. Soon I was perusing the menu. I decided to avoid the healthy options (well I am on holiday!) 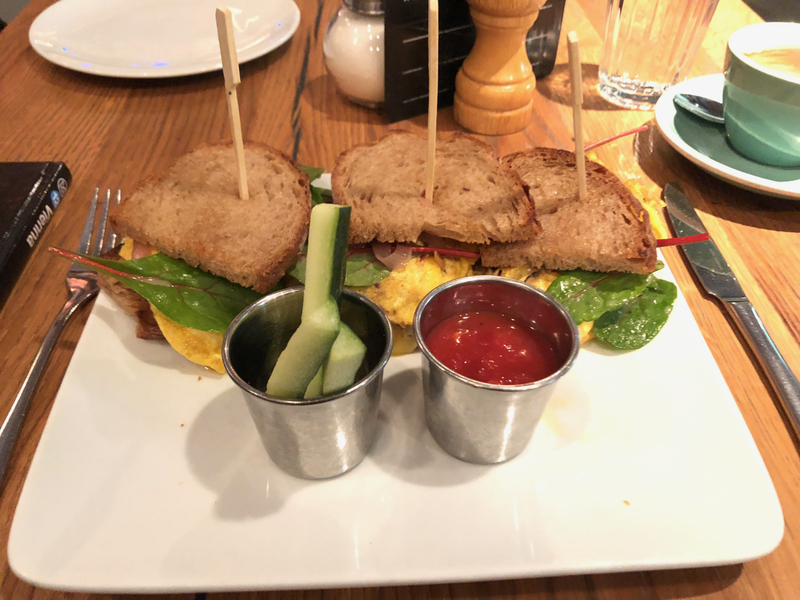 and instead went for the breakfast sandwich – with grilled gouda, bacon, spinach, tomato, red onion and herb omelette. It was a bit bigger than I’d expected! I wasn’t quite sure what the story was with the cucumber batons and ketchup. Was the cucumber to dip in the ketchup? Anyway, paired with a black coffee, it was a good start to the day – and I managed to eat it all! Breakfast came to €13 plus a tip, which I felt was pretty good value. Suitably breakfasted, I jumped on Vienna’s clean and efficient U-Bahn, or underground. 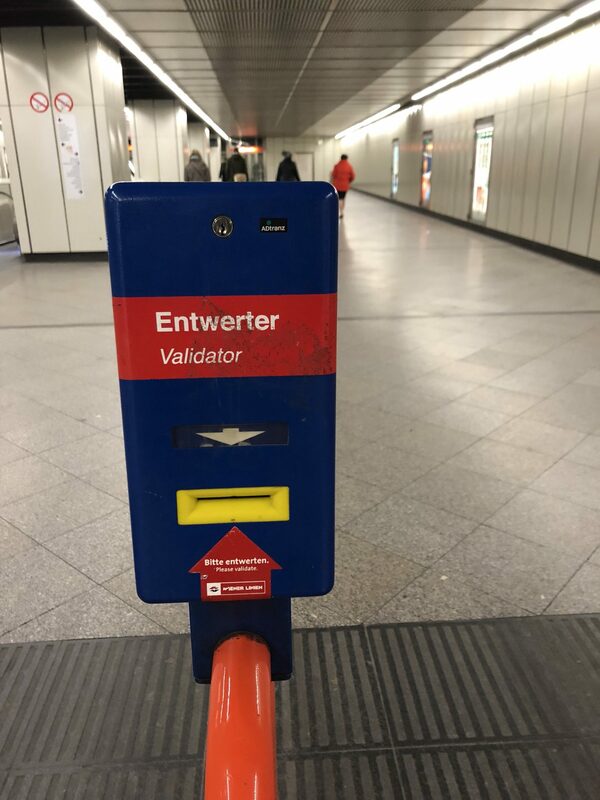 Like Berlin, Vienna’s public transport runs on an honour system – there are no ticket barriers to go through like in London. People are just trusted to buy a ticket and then verify it by stamping it via one of the blue machines shown below. After a 15 minute trip on the U2 line, I arrived at Taborstraße station. 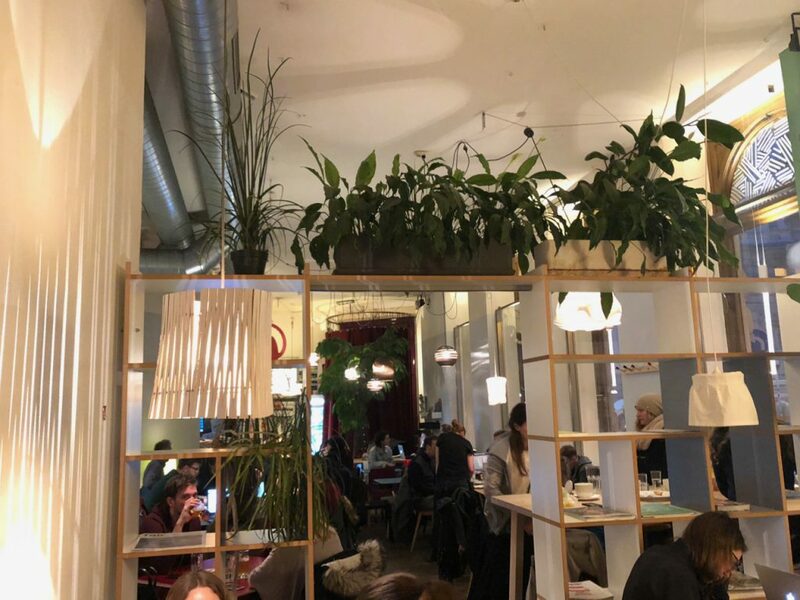 I was going to follow a walking route featured in one of my Vienna guide books to explore what is apparently the city’s real hipster neighbourhood – Leopoldstadt. It’s the city’s second district, and home to a diverse population including Orthodox Jews and Turkish people. It sounded like there were a couple of interesting spots to check out, so after getting back above ground, I started heading towards the first sight marked in my guidebook’s walk. 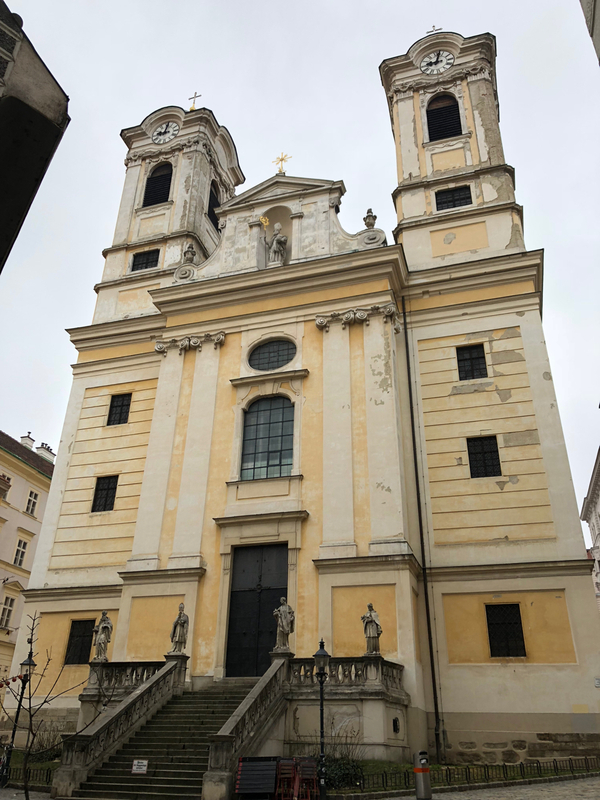 I passed the Concert Hall of the Vienna Boys’ Choir. Unfortunately I wouldn’t be hearing them sing at any point on my trip as they weren’t performing during my stay. It was a chilly morning, with a cold, biting wind blowing, which might have explained why Leopoldstadt’s Augarten park was so quiet. I wasn’t there to stroll around the park though – I wanted to see a relic from World War II. It was hard to miss. And it was grim looking. 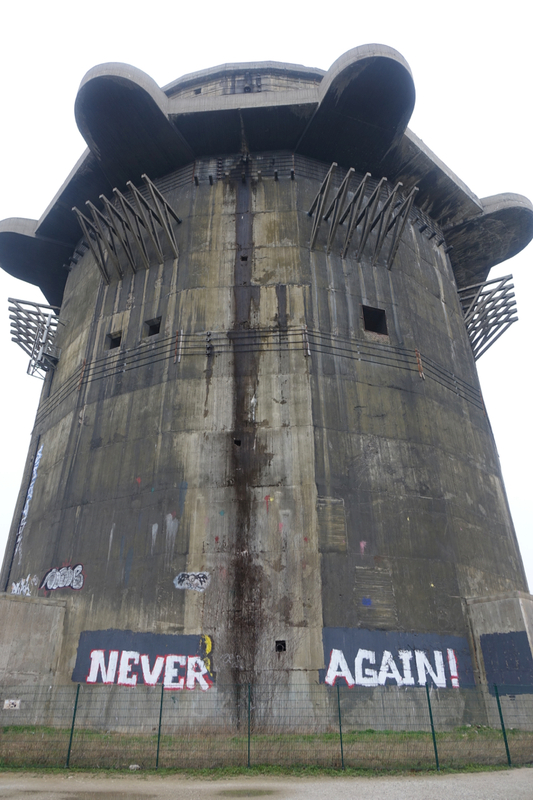 Flakturm VII G-tower is part of eight complexes of large anti-aircraft towers built by the Nazis in Germany and Austria after 1940. 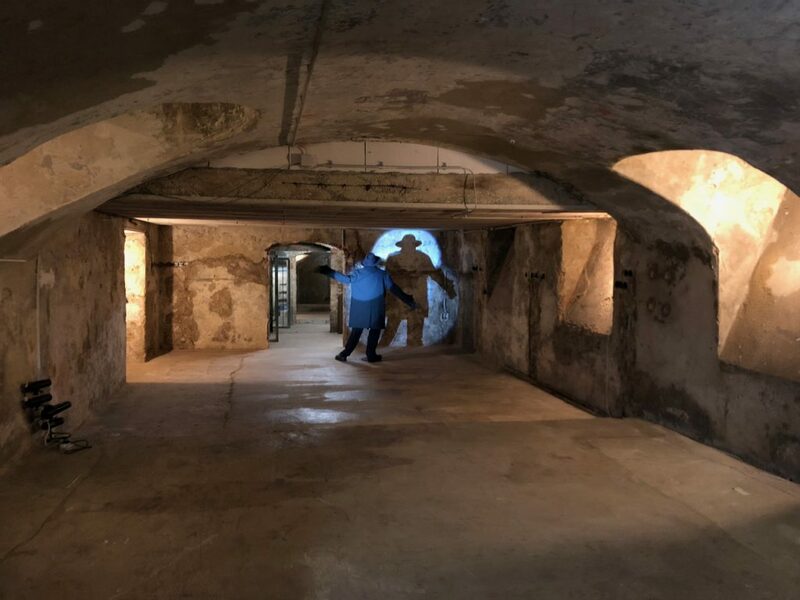 They were used primarily to defend cities from allied air raids, but could be air raid shelters for cities’ populations too. Flakturm VII G-tower seemed completely out of character with both the peaceful park, and the rest of Vienna’s architecture. 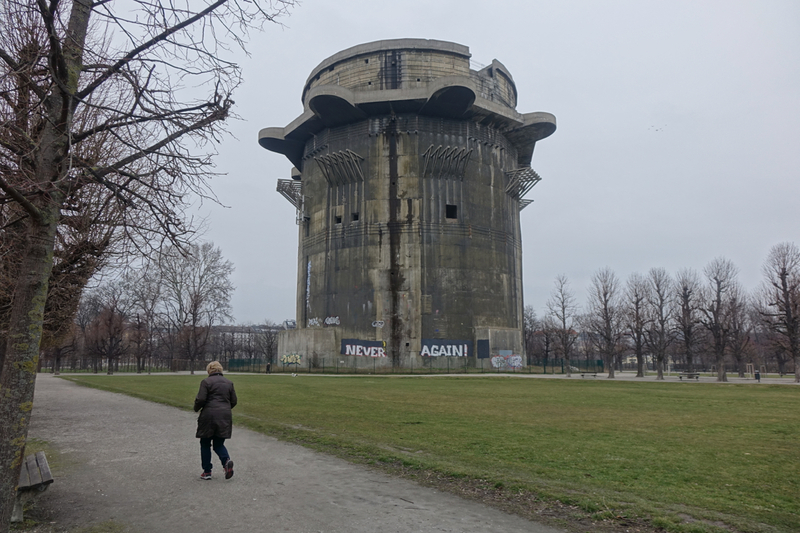 According to Wikipedia, flaktowers’ walls could be up to 11 feet thick. To me, it was a monstrosity and a suitable reminder of the ugliness of war. Today the tower is home to thousands of pigeons. I walked the circumference and just found it generally creepy. 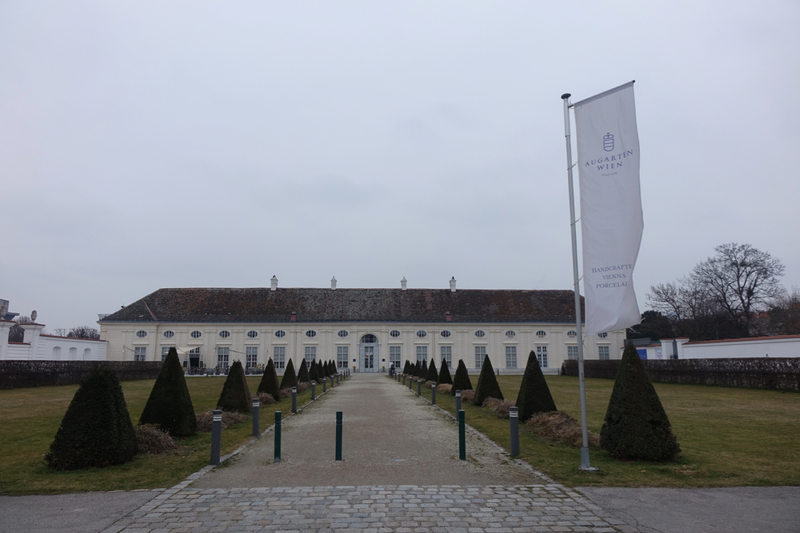 Walking back towards the entrance of the park, I passed the museum and factory of a company that’s been making porcelain in Austria for more than three hundred years. Feeling a bit chilly, I decided to nip into the shop and see if I could get a souvenir for someone. No was the answer to that! Look at the prices! 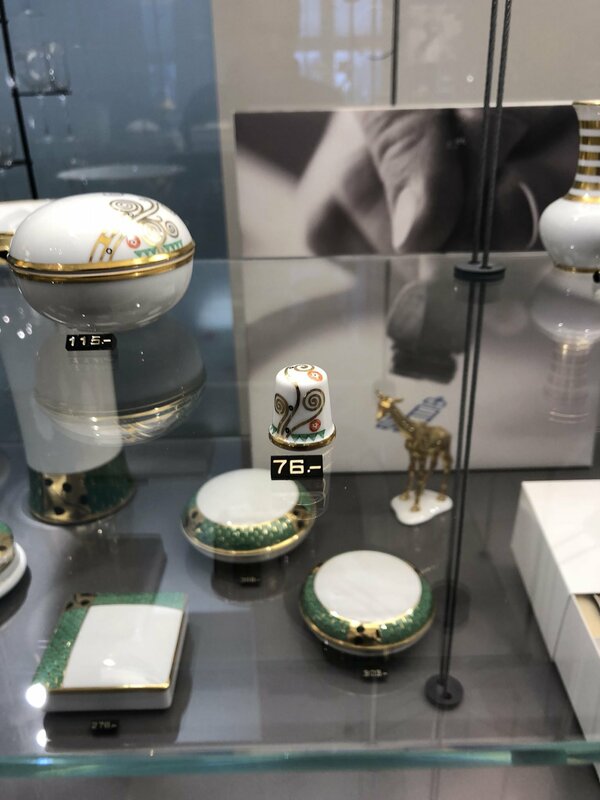 €76 for a thimble! And it was tiny! After a quick stroll around the shop, it became clear that I wouldn’t be leaving laden with porcelain goods, so I left pretty sharpish and walked back towards the underground station. 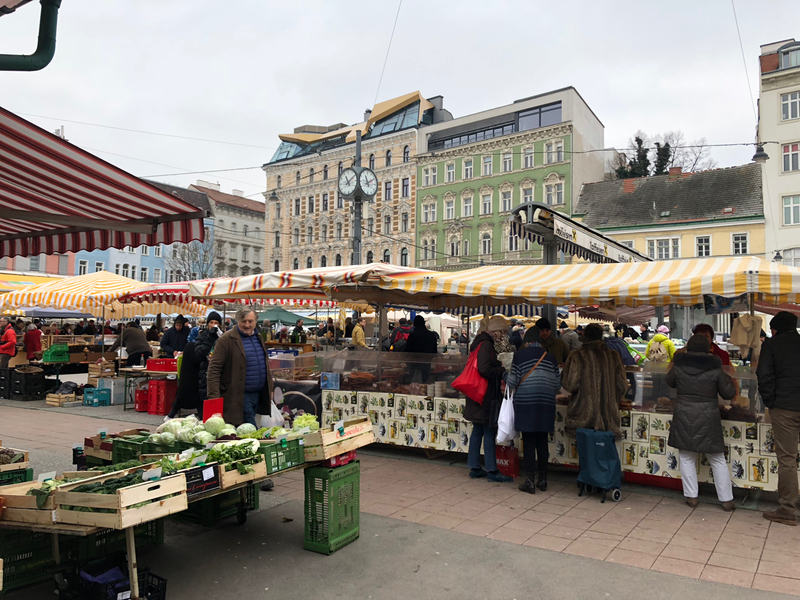 Crossing the road and taking several side streets took me to my next destination – Karmelitermarkt. 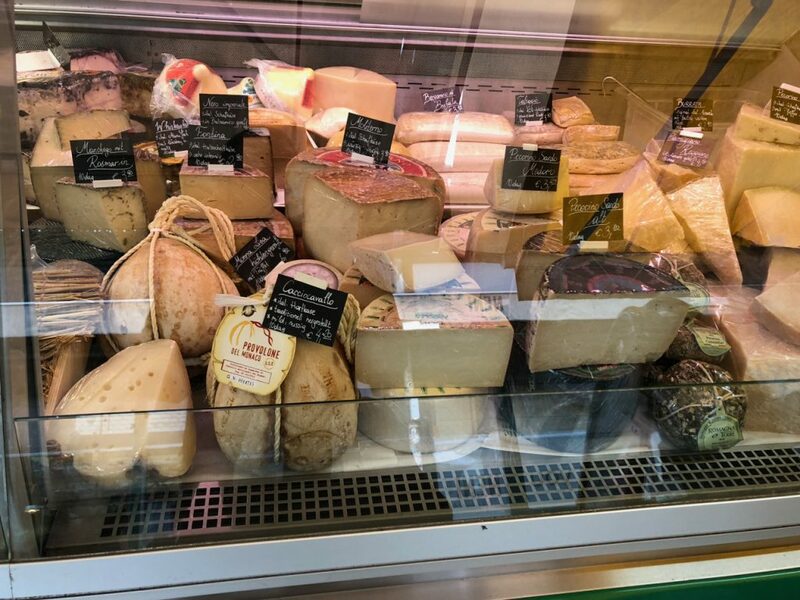 It had been described as a real, non-touristy, farmers’ market when I read about it – and there were also meant to be lots of nice little restaurants gathered around the market’s sides. I started to have a look around, but it turned out that there wasn’t really that much to see. There was just fruit, vegetables and hams for sale, alongside massive stalls selling loads of cheese. 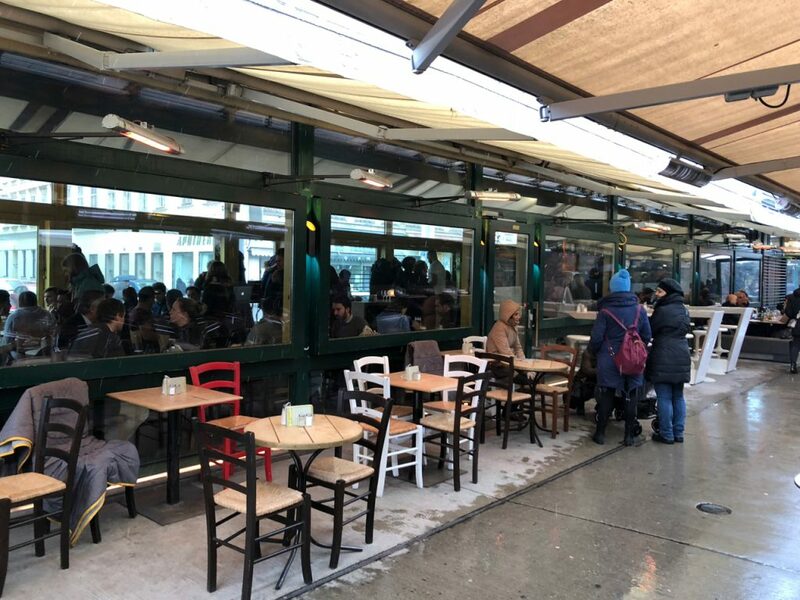 There were a couple of cafes and restaurants in small buildings by the market’s edge, but nothing that really took my fancy as a stop for lunch. Karmelitermarkt is obviously a market much used by locals, but I didn’t see anything worth purchasing and taking home. I did kind of rush round though, as by now it was getting pretty chilly. After my whistle-stop tour of the market I headed towards a couple of interesting shops I’d read about. En route I passed yet another pretty church. 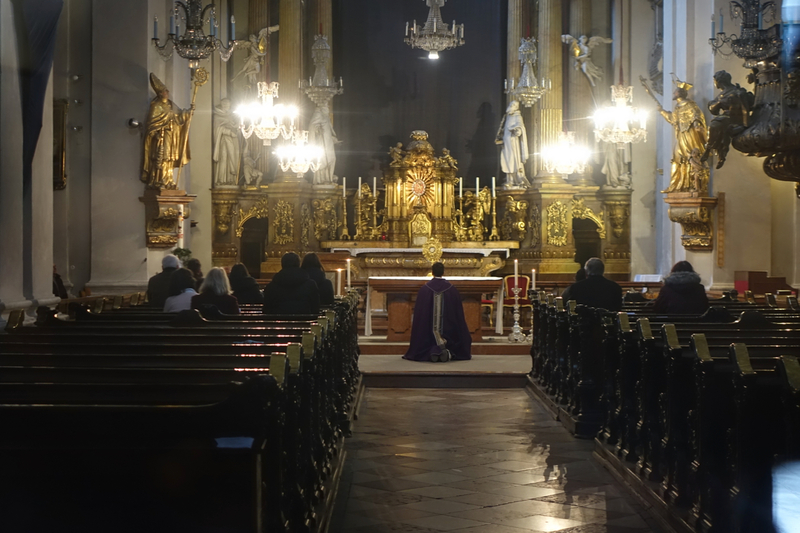 There was a service going on inside, but I did manage to grab a photo through the entranceway. It turned out the shops I’d read about weren’t too exciting. 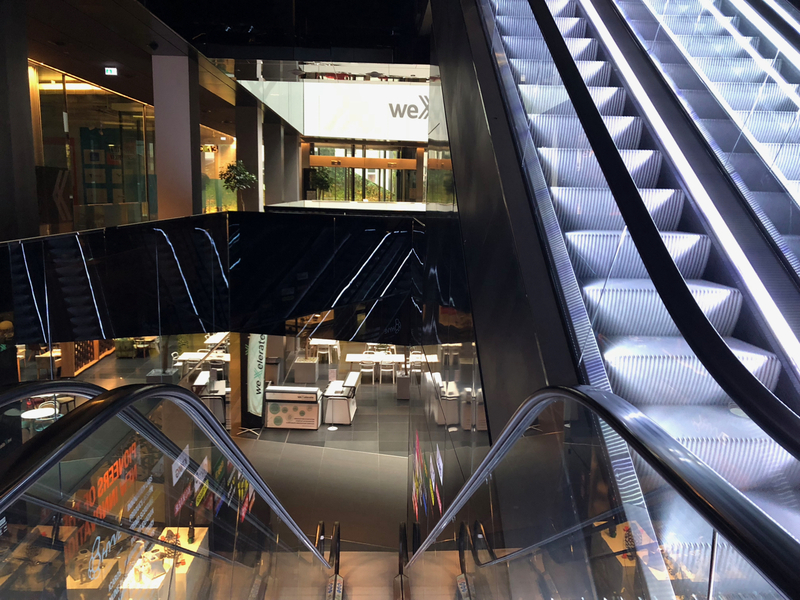 An apparently cool stationery store actually didn’t have that much in the way of stationery, while a design centre with lots of contemporary cool homewares seemed to be more of an office space with some small showrooms for high end furniture companies. I didn’t dare step inside any of the showrooms. 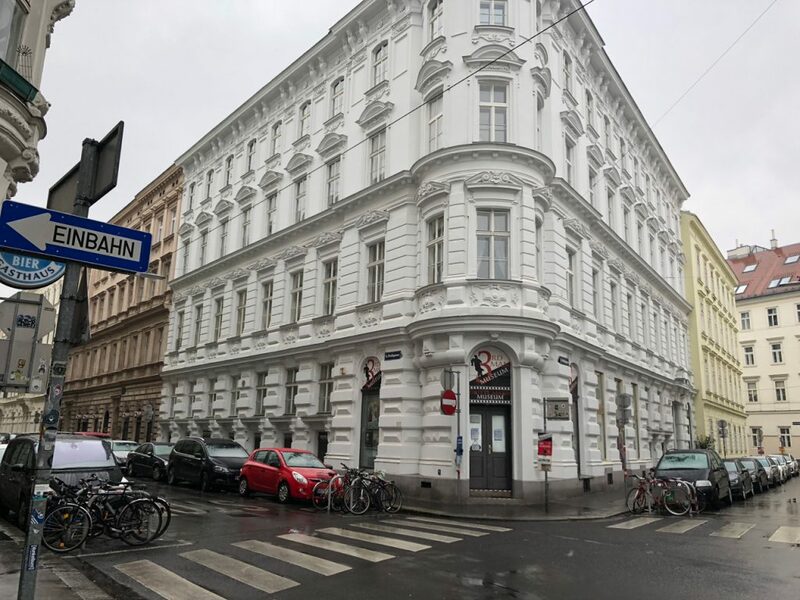 My trip around Leopoldstadt had been a bit of a disappointment to be honest! I’d spent it trudging around to places which just hadn’t been that interesting. It is meant to be an up-and-coming area, so maybe it’s still on the way up, or maybe I was just in the wrong bits. 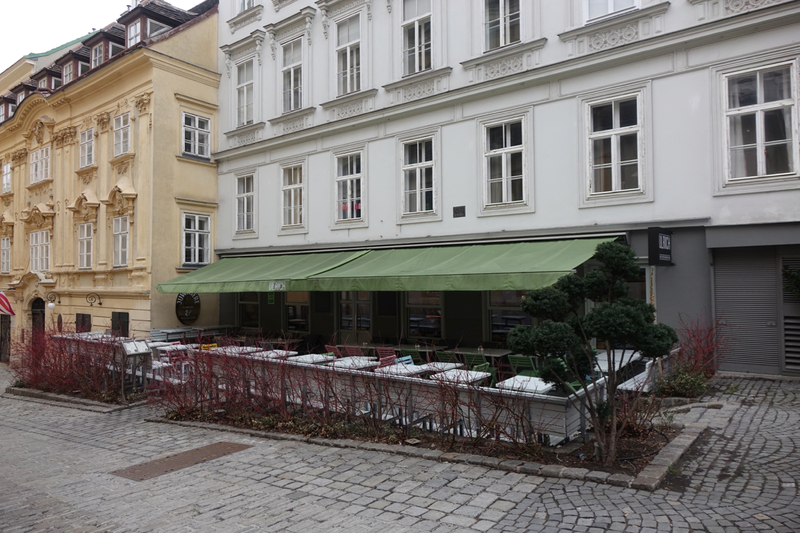 I decided to cut my losses and head for a coffee – in a small cafe that’s meant to serve up some of Vienna’s best. I was kind of all over the shop by the time I got there, and instead of asking for coffee I ordered a hot chocolate! So I didn’t get to experience their highly regarded coffee. I stood at the counter and drank my drink, which was rich and at least warmed me up. Thankfully my last stop in Leopoldstadt was just a two minute walk up the street. Supersense is kind of hard to describe! 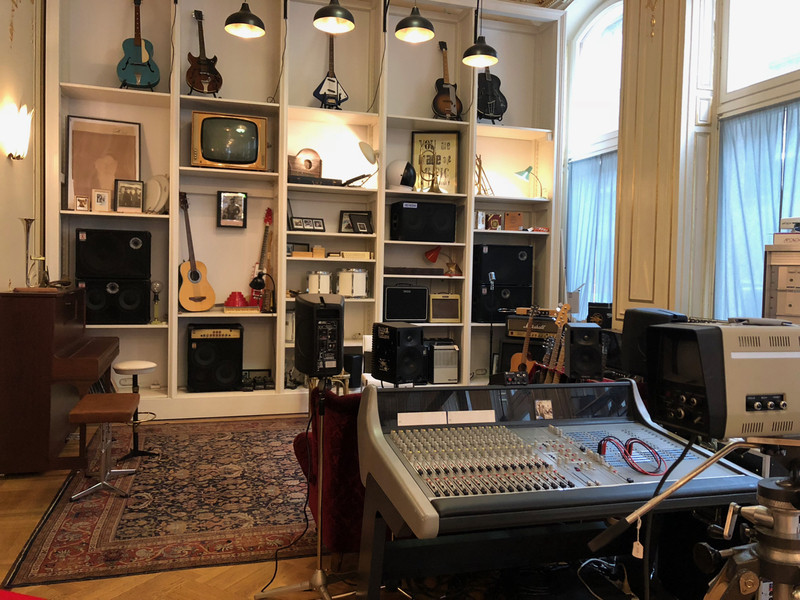 It has a cafe, and some stuff for sale, but it’s also a space where you can get your creative juices flowing. It bills itself as the home of the world’s analogue products – you can buy a whole load of instant cameras and kit, but also get your portrait taken by the world’s only large format instant portrait service. They’ll cut you a record, or make you stationery using their letterpress kit. It was a cool space, but again I didn’t see anything that made me feel like parting with my cash. It did make me wonder why more cities don’t have places where you can just wander in and be creative though! With lunchtime approaching, I jumped back on the U-bahn and headed towards Naschmarkt. 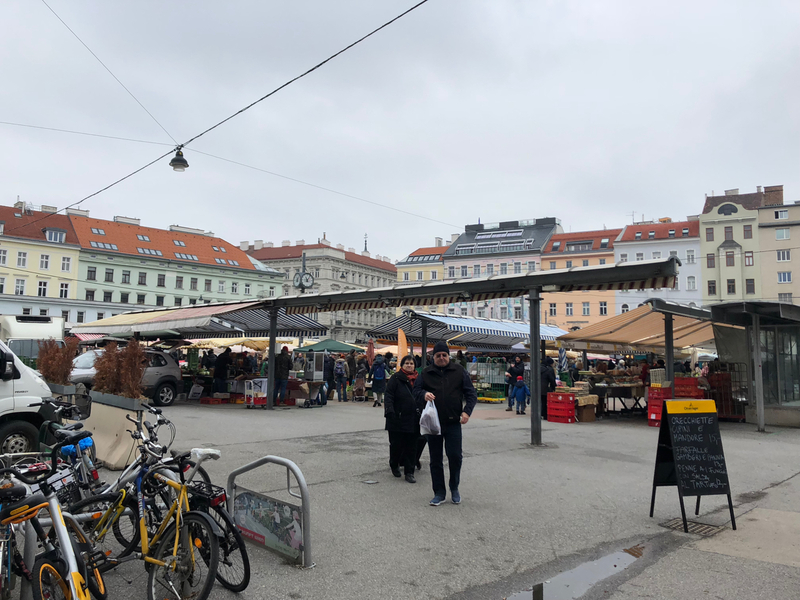 It’s Vienna’s biggest food market, and on a Saturday there’s a flea market on an adjoining site. I was hoping to wander around, soak up the atmosphere and get a close up look at all kinds of amazing produce. But that wasn’t going to be the case! By the time I got there it had got colder, and the snow falling had turned wet so it was more like rain. And though it doesn’t look like it in the picture above, the place was absolutely rammed with other tourists – making it difficult to look at the stalls or in general move much at all. … overall it wasn’t a great experience because of the crowds and wet weather. And perhaps it was just the section I found myself in, but every second stall seemed to be selling Turkish sweets or falafel! If you’re keen to check the place out on a Saturday, my advice would be to get there early. 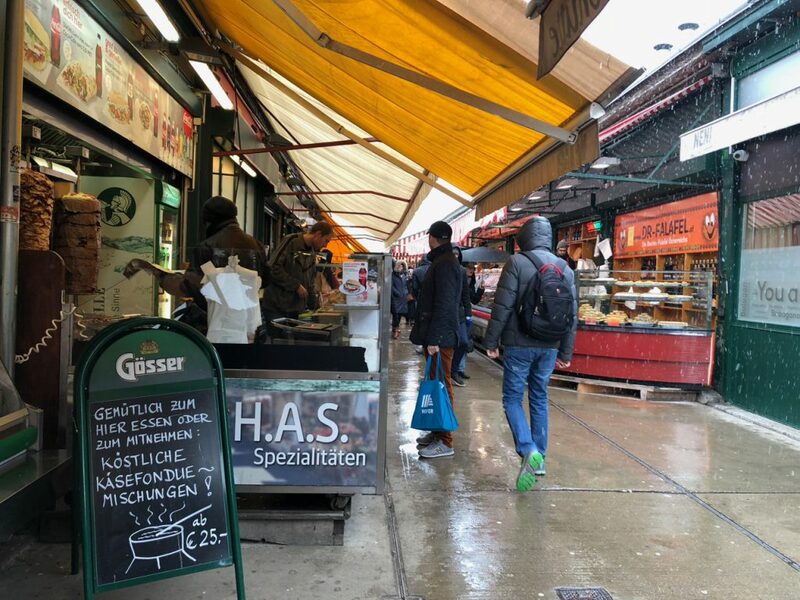 I decided to head to one of the market’s restaurants for lunch – Naschmarkt Deli. Inside a DJ was spinning some tunes, and the place was pretty busy with chattering locals. 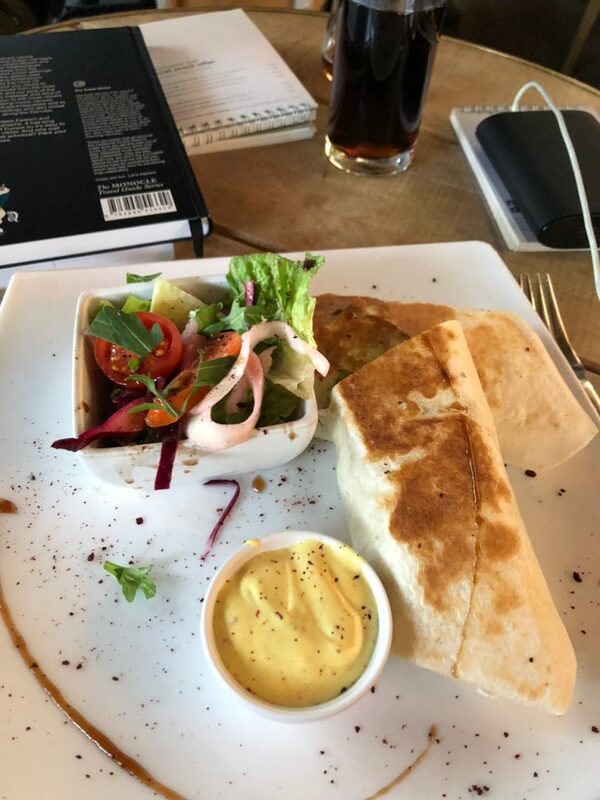 I grabbed a table, and after slightly too long a wait to place an order, was soon tucking into a chicken wrap. It was just what I needed after trudging around in the cold, wet weather and perked me up a bit – I was raring to go again. Just around the corner from Naschmarkt was a little shop I wanted to check out. 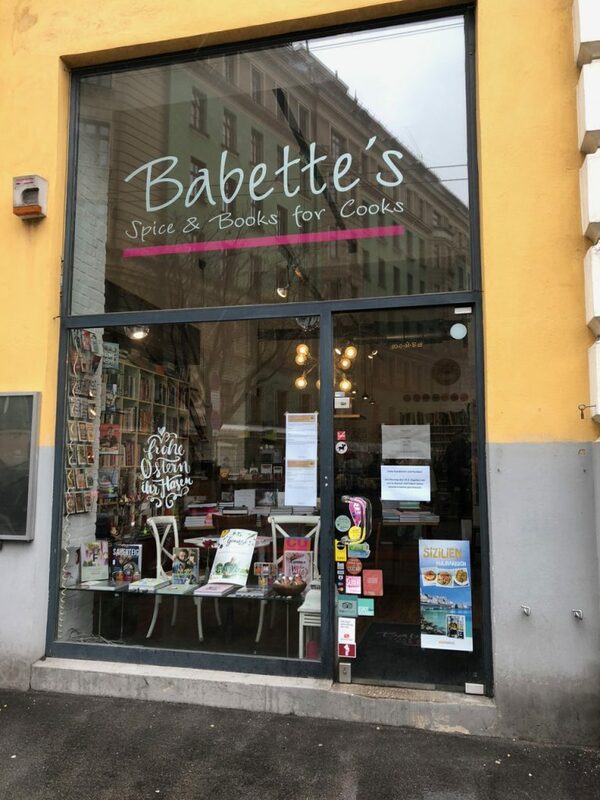 I can’t remember whether I’d read about Babette’s in a guide book or online, but it sells cook books and spices – as revealed by its full name, Babette’s Spice & Books for Cooks. Inside lies a treat for professional and amateur chefs – over 2,000 cookbooks are packed in to a relatively small space. 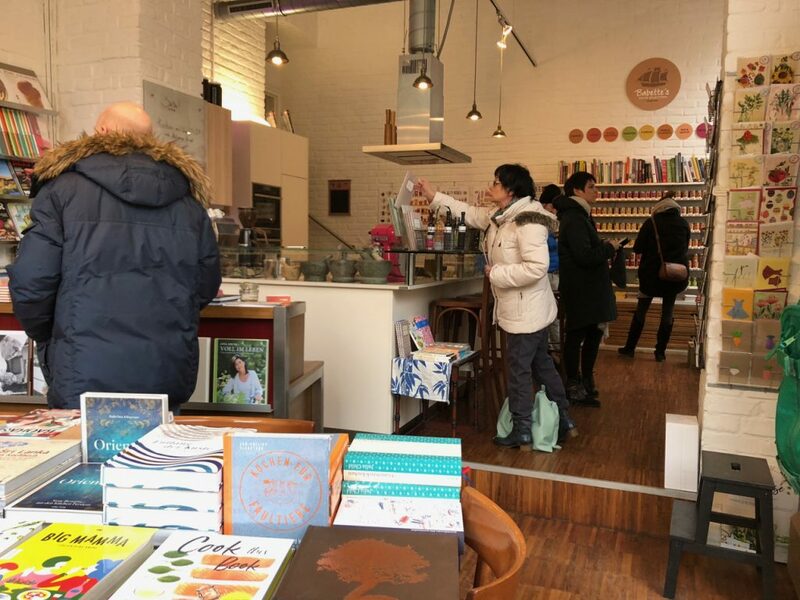 The store’s also home to cookery classes and a café. I made my way to the back of the shop where there were rows and rows of spices and spice mixes from the shop’s own factory. Rather than picking up spices which I thought I could get at home, I decided to buy some curry spice mixes – a tub of Thai Green mix and – to make my favourite curry of all – a Massaman mix. They weren’t cheap – at about €8 per tub – but they’ll last a while, and I thought they’d be good quality. The helpful assistant behind the till explained that though each tub came with a recipe, they were in German. Google translate will be helping me out with those! If there was an equivalent to Babette’s in Belfast, I’d be a regular visitor. 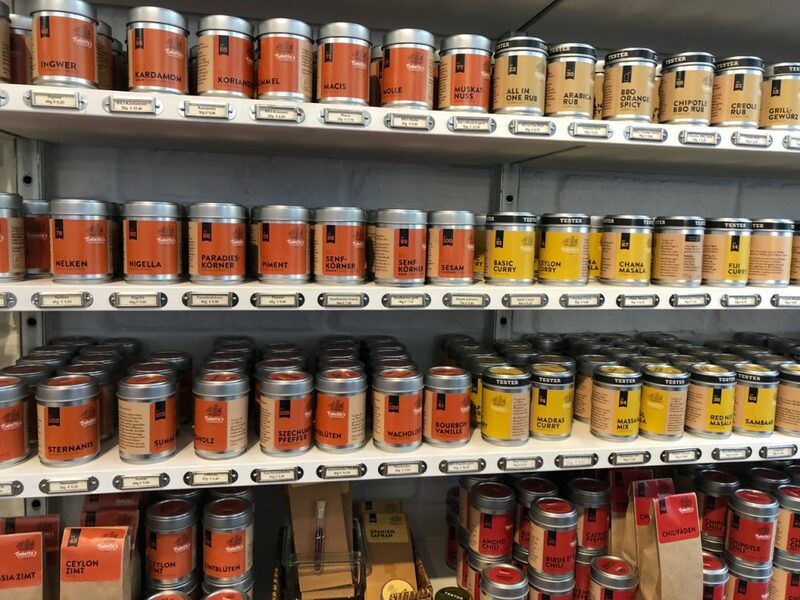 It may not have the massive range of a full blown deli food wise, but what it does – cook books and spices – it does really well. There was just five minutes to go before the weekly public opening of my next stop. Before making the trip to Vienna, to get a feel for the place, I’d watched the most famous film set in the city. In 1999, in a survey conducted by the British Film Institute, film industry insiders voted The Third Man, starring Orson Welles and Joseph Cotton, the best British film ever made. Released in 1949, the monochrome movie opens with American Holly Martins arriving in post-war Vienna to take up a job offer from friend Harry Lime – only to discover Harry has died. Holly then sets out to investigate his friend’s death – which he feels is suspicious. The Third Man’s the perfect film to watch on a rainy Saturday afternoon. The post-war Vienna setting, atmospheric cinematography and creepy soundtrack performed on a zither combine to create not only a unique film but a unique celluloid portrait of the city. 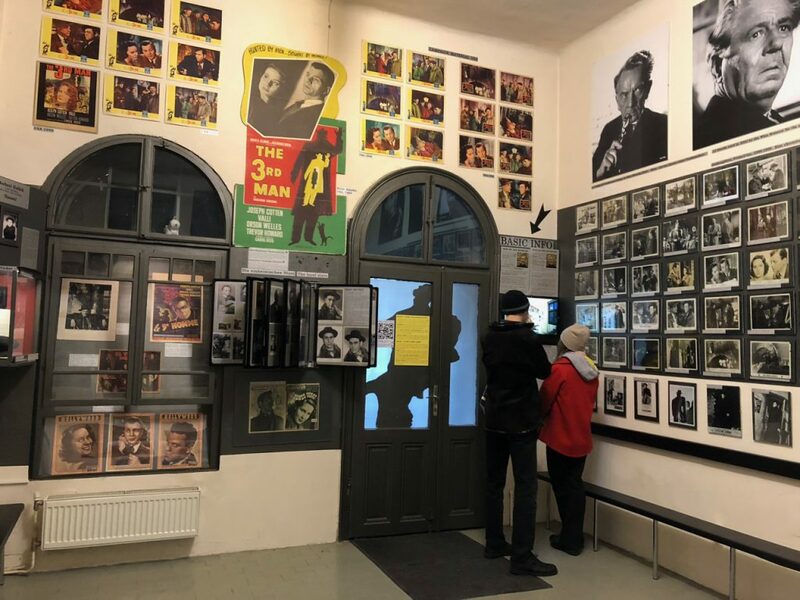 Now I was about to discover more – much more – about the film, with a trip to Vienna’s Third Man Museum. The Museum opens from 2pm to 6pm every Saturday, but there are openings on Wednesday afternoons sometimes for guided tours, and groups can book to visit at other times during the week as well. It’s privately run, and is housed in three buildings running part of the way down the street in the picture above – including the white and a bit of the brown building. Entering the museum’s main entrance, you pay your admission (it’s normally €8,90 but I got a small discount with my Vienna City Card) then exit back on to the street, walk to the first building of the museum, and enter through a small doorway where someone checks your ticket and explains the layout of the museum. I’ve never been to a museum like this. 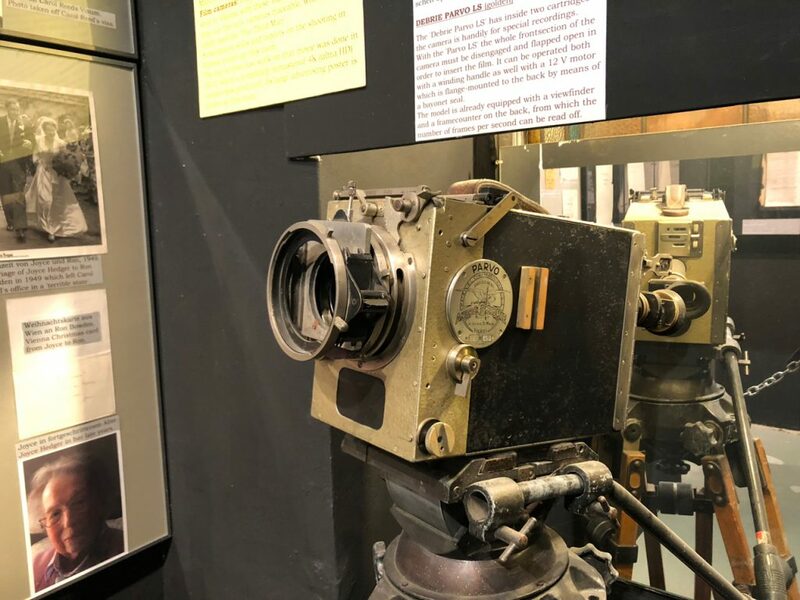 I’ve never (I don’t think anyway) been to a museum which is just about one film, but I was amazed by how much work had gone in to the displays, and by how much stuff to do with the film had been collected. The Third Man Museum’s run by a couple who obviously have a real passion for the movie. There was so much to look at in every one of the ten rooms. There were scores of original cinema posters for the film, row upon row of publicity stills and about a hundred copies of the novel in all different languages. There were countless artefacts from the film’s production – original scripts with actors’ notes on them, and not only a cap worn by a small boy in the film, but his aeroplane ticket to London for a publicity trip too. 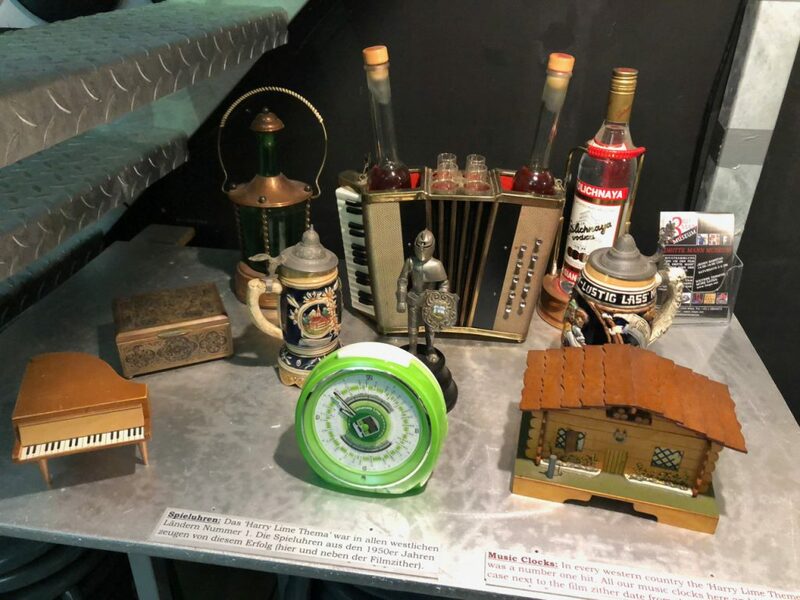 The sheer amount of stuff held by the museum is staggering – and it makes for a really interesting visit. One small room was dedicated to the film’s popularity in Japan – where it enjoys cult-like status. To give another example of the amount of detail in the collection – there was a film playing in that room showing one of the museum’s owners at a Japanese railway station. The reason that was showing? The film’s theme plays over station loudspeakers there every time a train arrives. In the building next door was a camera used to make the film…. 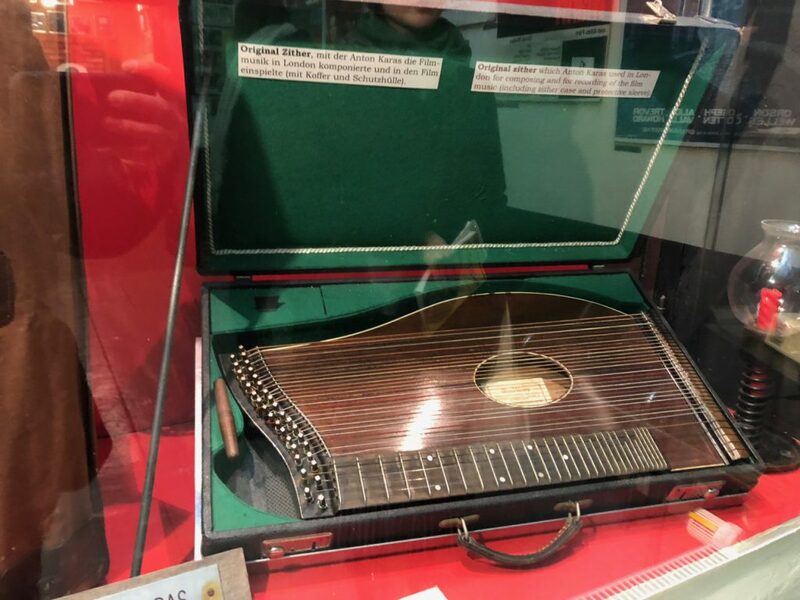 …and even clocks and musical boxes that played the theme tune too. Like I said, I’ve never seen such a detailed collection on anything before – it was mind-boggling! I spent a long time just staring at everything and reading in awe about the film and its production. 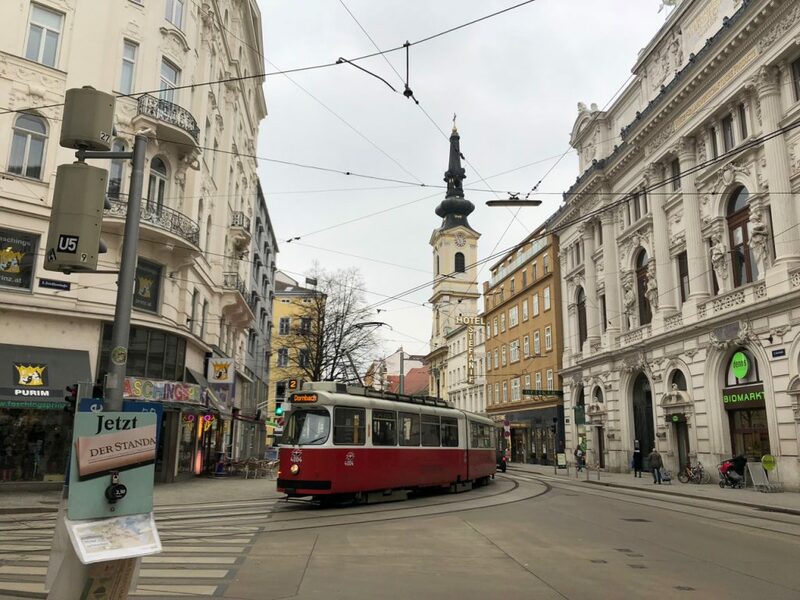 Now while they didn’t have the original grate from the film, they did have a grate from Vienna’s streets – and getting your fingers through it is impossible as it’s just too deep. 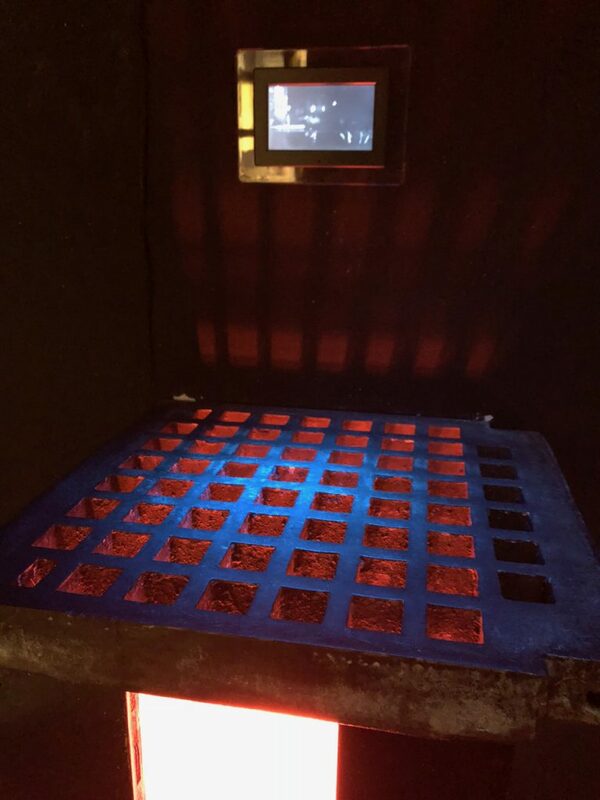 A notice nearby explained that the thinner grate shown in the film was specially made to get that famous shot of fingers reaching for freedom. The place was full of interesting little facts like that. On coming to the end of the exhibit in the museum’s second building, I sat down with the rest of the small group that had been strolling around to watch a short sequence of the film. It was shown using an original print playing through a projector that was used to screen the film in Vienna in the 1950s. 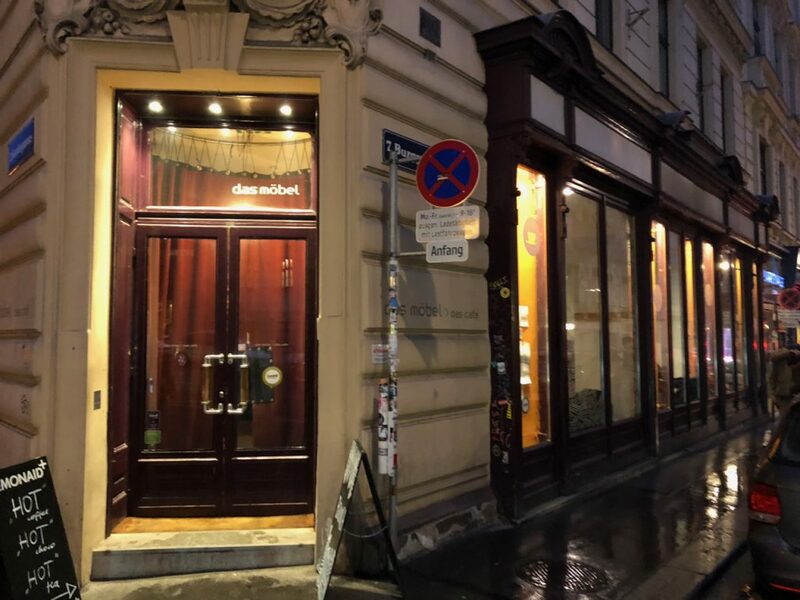 Once the lights came up on our short screening, we made our way to the last of the museum’s buildings, which displays information about Vienna before, during and after World War II. This bit of the museum reminded me a bit of the private Checkpoint Charlie museum I visited last year – I couldn’t quite work out in which order I was meant to read everything in, so after trying to work it out and then kind of giving up, I just skimmed the displays in this section before heading upstairs to the shop and exit. Passing by a mock up of the film’s sewer scenes en route. After saying goodbye to the owner and stepping back out on to the city’s streets I was amazed to see I’d spent two hours in the museum. 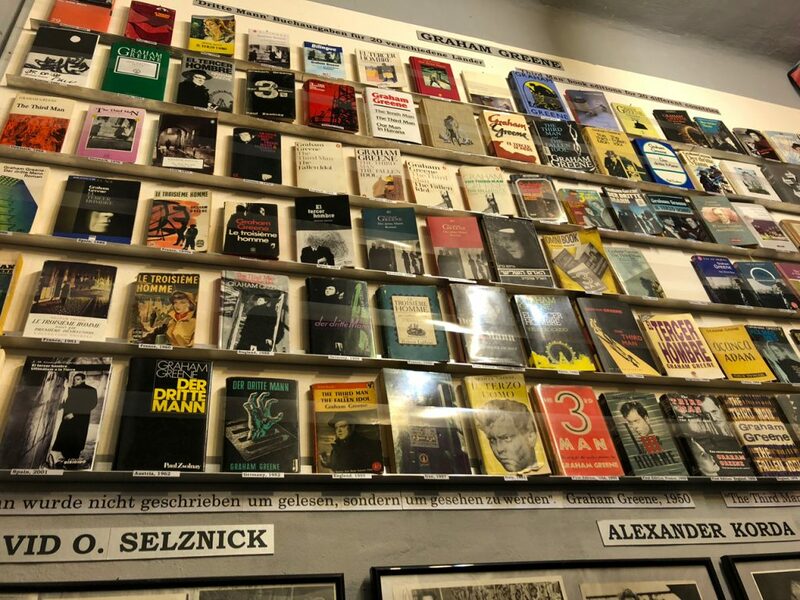 If you’re a fan of the film (and even if you’re not) and find yourself in Vienna, I’d definitely recommend paying a visit to the Third Man Museum. The owners have built up such an amazing slice of film history, it’s hard not to be swept up in their enthusiasm. Taking all of that movie memorabilia had left my brain in need of a bit of relaxation, so I decided to head back towards my hotel and go for a coffee to write up my blog. Catching a tram seemed like the fastest way back to the MuseumsQuartier. As I waited for the correct one to come along I called one of my sisters for a catch up. Six or seven minutes later, my tram pulled up, and I hung up so I could concentrate on working out where to get off. After a while, though, I began to feel confident that I’d be able to recognise my surroundings sufficiently to get off at the right place, so I called my sis’ back. That turned out to be a mistake. Eh… that’s just to show you what the inside of the tram looked like. 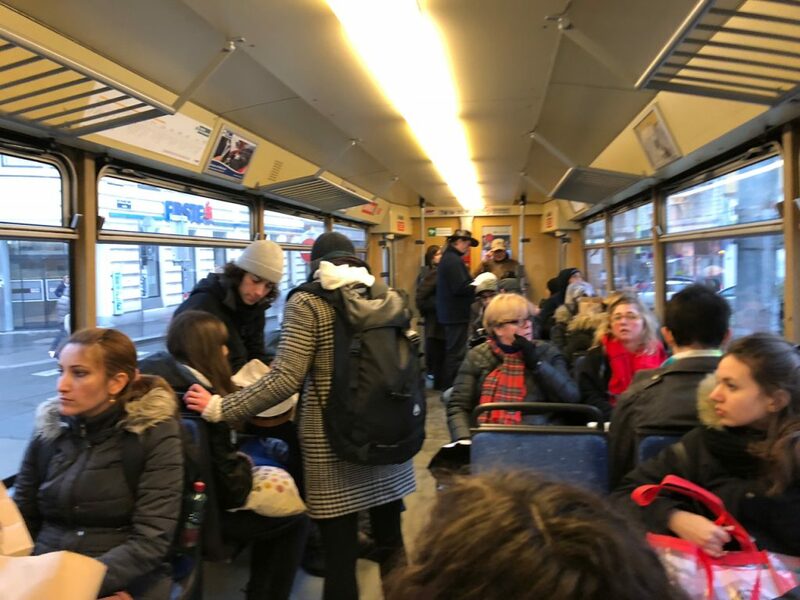 Anyway, after a while, the tram stopped and everyone got off. So I thought we were at the end of the line. But confusingly some people got back on. So I stayed where I was, and the tram started moving again. It was only ten minutes later when my surroundings began to look very familiar that I realised I was actually back where I started . I had to jump off, cross the road, and wait for another tram to take me back the way I’d just been. There seemed to be some big demonstration taking place in town that may have affected the tram’s route, so I’m going to blame the whole palaver on that. 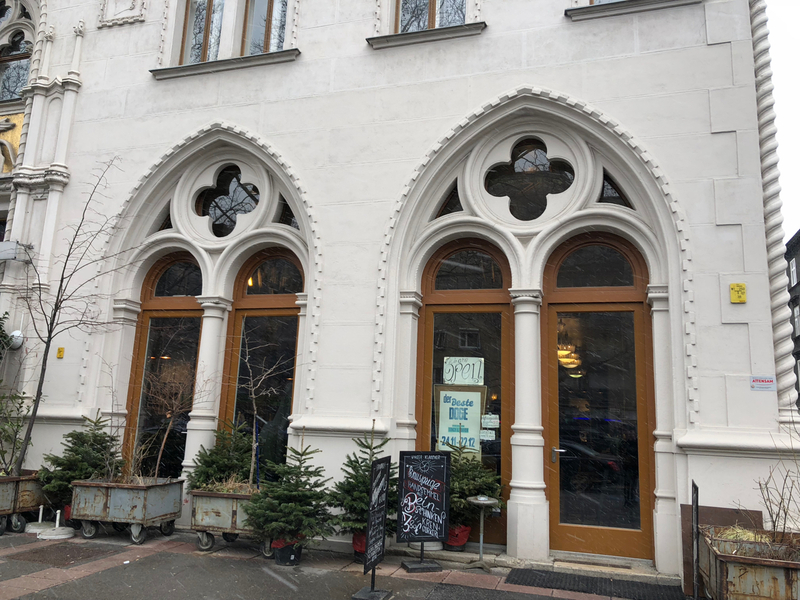 I decided to make my way to a cool looking café just around the corner from my hotel that I’d spotted when strolling around Neubau the day before. das möbel was pretty busy, but unlike in Balthazar, I was able to get a table. 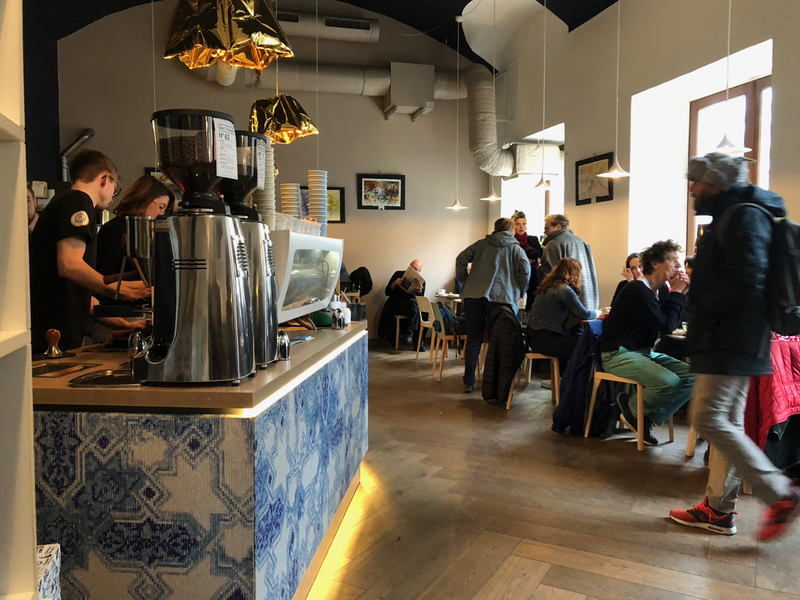 What I didn’t realise until later on is that this is a cafe with a difference – in that every piece of furniture in the place is for sale. Apologies for that poor photo – I was just trying to avoid including the full table of people sitting right next to me! I ordered a coffee from the waitress, who I was pleased to discover spoke English, but was perhaps not entirely helpful. When I went up to the counter and asked her what the cakes were she told me that was written beside them and walked off. Well yes it was written on the display case, but only in German which didn’t really help me given my long forgotten O-grade experience of the language! 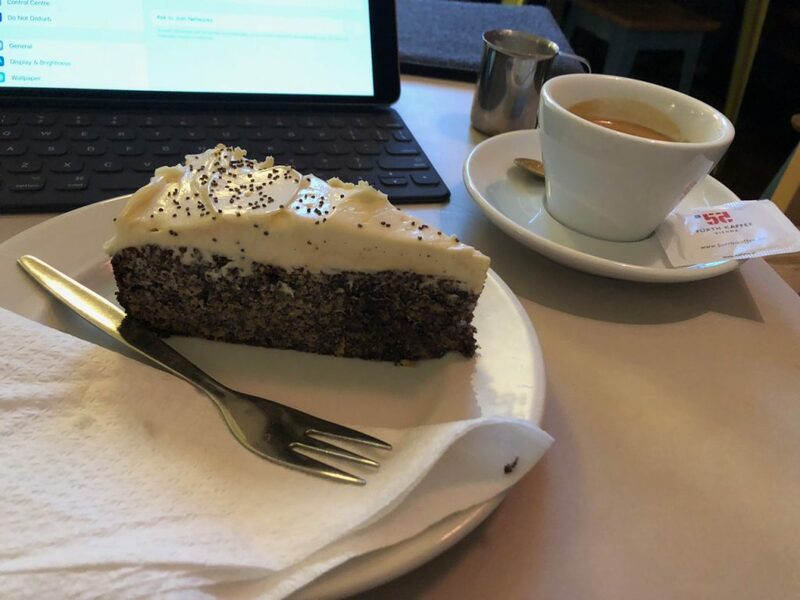 Before long though I was tucking into what I think was marscapone and poppy seed cake while warming up with a coffee, writing my blog and doing a bit of research on what to do the next day. After settling my bill, I walked back to the hotel, and had a glass of tasty Austrian white wine in the seating area beside reception as I carried on writing my blog. Before I knew it it was quarter past nine. It was dark and wet outside and I just couldn’t be bothered doing any more walking. 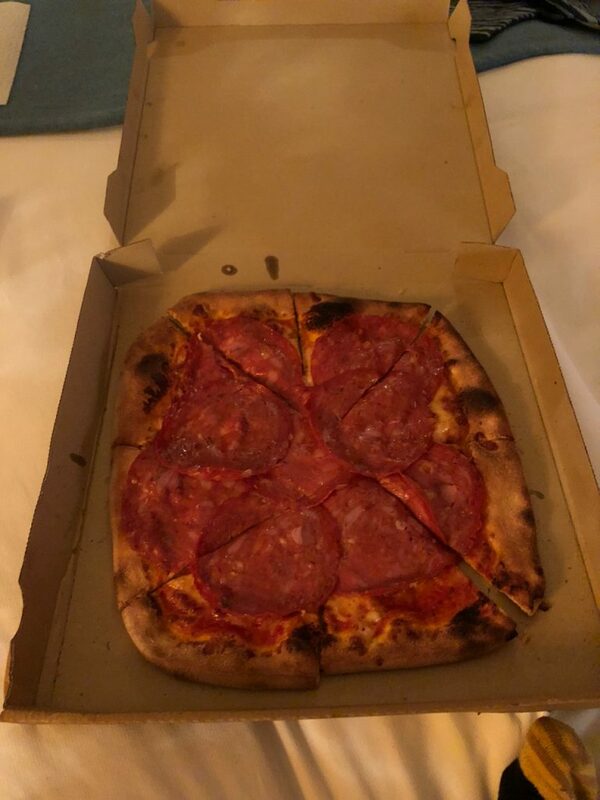 So I decided to grab a pizza from the hotel’s restaurant. While my hotel didn’t offer room service, you do get a 12% discount if you call the restaurant with a take out order and then go down to collect it. I ordered a salami pizza, and around fifteen minutes later got a call to say it was ready. Thank goodness – as by now I was both exhausted and hungry. Back in my room, I got ready for bed, switched off most of the lights, and hopped onto the bed to enjoy my salty dough based dinner. I opened up the box to reveal not a salami pizza but a plain one . I had to get dressed again, head back downstairs and wait while they replaced my pizza with the one I’d actually ordered. They were apologetic though. After polishing off my pizza, I watched a bit of tv before once more falling into a deep sleep. The next day – Sunday – would see me travel to a country I’d never set foot in before.